Taupō wetland or swamp was uplifted by a series of earthquakes between 700 – 3,900 years ago. It has cultural and spiritual value for Māori, and they traded flax here in the 1830’s . In the 1880 ‘s, businessmen formed a company to harvest flax for Foxton mills. Taupō Wetland is two kilometres north-west of the Ohariu Fault and the area has been tectonically uplifted by a series of surface rupture earthquakes between 700-3,900 years ago ( 1). The southern end of the swamp has been drained and developed for farming and industrial use. And studies have shown that the wetland was once wetter than it is today (2). The wetland holds special cultural and spiritual value for Māori. Taua Tapu track which linked Taupō Pā (Plimmerton) and Waimapihi Pā (Pukerua Bay) historically gave access to the wetland where mahinga kai and flax or harakeke was gathered. Flax became a valuable commodity in the trade between Māori and early European visitors. The strong fibres flax contained were excellent for the purpose of ropes and rigging. In 1815 flax was first exported to Sydney, Australia by Samuel Marsden in the boat Active. The invention of the flax stripper in the 1860’s started the phenomenon of flax milling which was a feature of the New Zealand economy for the next 100 years. 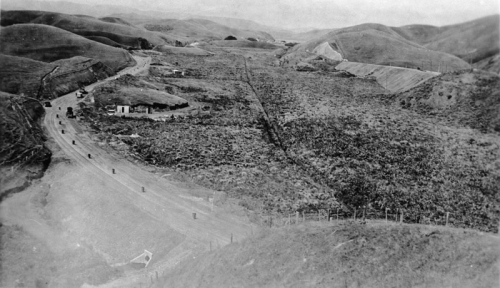 Taupō Wetland was one the large scale flax harvesting sites for this industry. In the 1880s a number of prominent businessmen among them, Messrs Plimmer, Levin and Shannon formed a company to provide flax for mills at Foxton. These same men also established the Wellington Manawatu Railway Company which opened in 1886. As the demand for flax increased, plants were gathered from a variety of sources for planting in the swamp which accelerated the natural process of plant succession and ensured a ready supply of flax for the market. During the war trenches were dug along the edge of flax swamp to serve as air raid shelters for children at the nearby school. There were also stories of children waiting in the flax alongside the rail line for American soldiers who liked to travel on the platform of the last carriage, to throw them packs of cigarettes. They would then dive back into the flax to have a puff. It is unclear when flax harvesting ceased with some accounts saying it had stopped by 1947 and others saying it continued right up to 1966. Flax was only ever harvested at Taupo Swamp, not processed, so there is little if any signs of the industry that can be seen today. The swamp area was purchased in 1986 by the Queen Elizabeth II National Trust and has since been a natural reserve.